Get episodes via email as they're released! Can busking under a tunnel change your identity? Award winning writer, performer and nametag expert premieres a concert documentary that sticks. Scott Ginsberg made a name for himself wearing a nametag twenty-four seven. He built a brand, a business and a career as an author, professional speaker and business strategist. But after fifteen years, he decided to branch out into an entirely new medium of creative expression. Ginsberg wasn’t waiting around for somebody to greenlight his creativity. He didn’t have to ask permission to innovate. He simply took advantage of the invaluable production value and decided to make a documentary about the transformative power of performing in the tunnel. 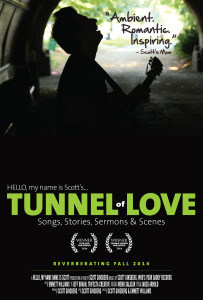 Tunnel of Love: Songs, Stories, Sermons & Scenes, is a feature length concert documentary written, produced, directed and scored by Scott Ginsberg. The film explores the intersection of identity, belonging and creativity. The movie takes a look at the transformative power of live music, both on the audience and the performer. It pays homage the sonic potential of natural acoustics. And it’s a playful narrative about two young lovers in the process of changing their pronouns. Through live performances, playful and romantic exchanges, unexpected creative moments of conception and behind the scenes storytelling, Ginsberg’s film takes you on a heartfelt journey about what it means to be an artist, a romantic and an opportunist. Scott, however, had zero experience writing, producing, directing, scoring and funding an independent film. But that didn’t stop him. Because if there’s one thing he does have experience with, it’s undertaking creative projects in which he has no idea what they hell he’s doing. Scott partnered with Emmett Williams of Mission Man Media, an award winning artist, internationally known musician and nationally exhibited photographer. He served as director of photographer, editor and overall production manager. He used Elance to find local audio technician, Jared Alder, to engineer the sound for the film and produce original motion picture soundtrack, which was released as a stand alone album. What happens inside the tunnel of love? Kids biking. Families picnicking. Tourists dancing. Friends singing. Couples dancing. Family clapping. Babies crying. Teenagers yelling. Police patrolling. Birds chirping. Balloons popping. Dogs barking. 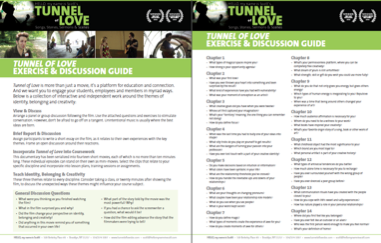 Tunnel of Love will be initially presented as a serialized, episodic documentary. Since the movie’s centerpiece is a live concert, Scott is premiering each song as a stand alone chapter on his website and social channels. There are 14 songs in the concert, so the distribution timeline will occur over a period of 14 weeks, from September to December. Every Monday, fans will get a new song emailed to their inbox. And by the end of the year, the entire movie will become available online for free, forever. But the film isn’t a complete vanity project, Scott laughs. The documentary homepage also offers discussion guides and curricula for educators, learning institutions, companies, congregations and other organizations to help spread the messages of identity, belonging and creativity. Can we interest you in a feature story, an interview with Scott Ginsberg or a review of his new documentary? For those who might be wonder about how to overcome the challenges of identity, belonging and creativity, Scott’s movie offers up the smartest answers to the toughest questions that plague all of us. If you’d like to watch his full movie, please contact below. Media review copies, high resolution photos and interviews available upon request. This article may be used in whole or part, with short bio and links to website please. Special feature story inquiries and blog posts welcome. Email questionnaires, permission to use excerpts or fresh articles available to meet your needs. Fire away and let Scott know how he can help you! What happens when you wear a nametag twenty-four seven? Even to bed? Just ask Scott Ginsberg. In the beginning, it was just a gimmick to make friends. But soon, his crazy idea didn’t seem so crazy. In the past fifteen years, Scott’s social experiment has evolved into an urban legend, world record, cultural phenomenon and a profitable enterprise. Simply google the word nametag, and you’ll see his work benchmarked as a case study on human interaction, revolutionizing the way people look at approachability, identity and creativity. 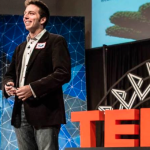 Since 1999, Scott has authored 30 books, released six albums on his own record label, published an award winning blog, given a TEDx talk and delivered presentations and corporate training programs worldwide. He’s the only person in the world who wears a nametag 24-7. Even to bed. He was also inducted into Ripley’s Believe It Or Not as the world record holder of wearing nametags. Tunnel of Love is his first movie. "A story about the gentle but dramatic transition into caring more about the beauty of 'the we' than any other success imagined as separate entities." Tunnel of Love is feature length concert documentary about the intersection of identity, belonging and creativity. The film was written, produced, directed and scored by Scott Ginsberg, and was edited and shot by Emmett Williams. Copyright © 2015 HELLO, my name is Scott!